California iPoker has traveled down a tumultuous and bumpy road since legislation was first introduced in February of 2014, and if this week’s joint informational hearing is any indication, politicos in the Golden State won’t be veering off that path anytime soon. The California Senate and Assembly Governmental Organization (GO) is a collective bi-chamber committee that oversees and debates many topics including Indian gaming and casinos. Wednesday’s hearing was to discuss gambling, but the subject of online poker was barely even addressed. The fact that iPoker wasn’t discussed is due to ongoing tensions between Indian tribal leaders, politicians, commercial gaming companies, and racetracks, entities that all hold differing views and opinions on legalizing the game online. However, the subject of online poker was briefly discussed when Rick Baedeker, executive director of the California Horse Racing Board, proposed his industry be permitted in any online poker legislation. With the horseracing business in a long, continued downward spiral that saw three major venues close, Baedeker believes online poker could be its saving grace. “Given its long history in the state, deep routes in the California greenbelt and 13 years of legal online wagering, racing should receive every consideration to participate in Internet poker,” he said. Two additional GO hearings on gambling are scheduled for June 24th and July 8, but like May’s session, don’t expect much to be accomplished. The potential marriage of California and online poker has been one long engagement, so it’s not terribly surprising that the GO hearing failed to advance the discussion or bring its passage nearer. But poker can’t complain without action of its own, which is why PokerStars brand ambassadors Daniel Negreanu and Jason Somerville descended on the state capitol of Sacramento to hold an informative iPoker awareness meeting. 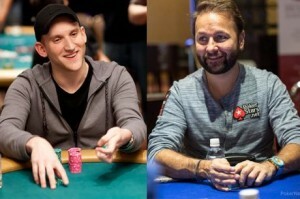 Held on Thursday, the day after the GO hearing, Negreanu and Somerville met with attendees, discussed how iPoker operates and is regulated, and even played some casual free money online hands. And according to the stars, the event was a smashing success. One key issue being debated among lawmakers is the so-called “bad actor” clause, a condition that would likely prevent PokerStars from entering the market in California even if the state would legalize iPoker. The provision would ban operators who continued to do business following the Unlawful Internet Gambling Enforcement Act of 2006. PokerStars, the world’s largest online poker network, is banking on the fact that it will be qualified to tap into America’s most-populated state. It now has agreements in place with the Morongo Band of Mission Indians, the San Manuel Band of Mission Indians, and three Los Angeles card rooms to offer online poker should it become legalized.